Bidnapper's flat rate auction sniper service prices give you unlimited sniping for one price. No percentage commission or per - snipe charge. No other costs. Pay monthly, quarterly, semi-annually, or annually. 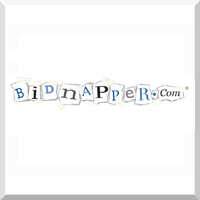 Bidnapper is the most comprehensive auction sniping solution, supporting 30 auction sites, more than any other service. More than 30 auction sites, including eBay, GunBroker, Bidz, eBid, Delcampe.